LOVE this bracelet- everyone notices & inquires...and it's less annoying than going out with a puppy. fits perfectly and is easy to put on-the only thing i would change would be to make it wider 1/2"+; however it does look great as is!! thanks STAUER for the price & quality. A very well made and good looking man's accessory no matter what the attire may be ! A good value for the price. Cool looking for the dress down. I love the leather braid and steel accents. Definitely conveys character and that one-of-a-kind look and feel. Happy I got it. The old nursery rhyme says that boys are made of "slugs and snails and puppy dog tails." Maybe so, but as men, we prefer more appealing raw materials. Rebellion has always been at the core of rock 'n' roll, and the fashion de rigueur for romantics, rockers and rebels has always been leather. 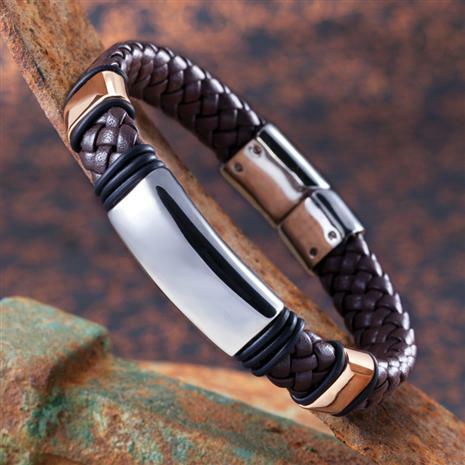 The latest trend in masculine accessories is woven leather bracelets mixed with polished metal and loaded with post- industrial details. Think Middle Earth meets Mad Max. We know what guys want style that goes right to the edge, but not over the top and we've found it in the Renegade, a leather bracelet for men. 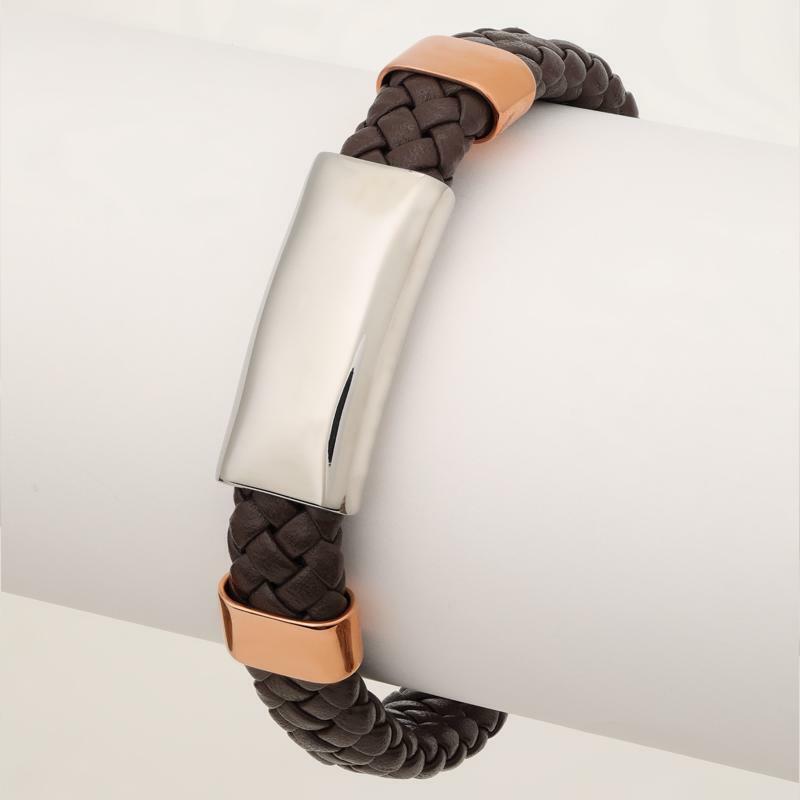 Based on Italian designs, the bracelet features a classic, all natural brown leather braid with a steel buckle closure. With a shining steel band on top, small gold bands on either side and black rubber rings spaced throughout, this bracelet has a modern and masculine look, designed for warriors and workingmen. Sure, it's a little rebellious and definitely not standard business attire, but it'll show the world that underneath that fresh-pressed suit beats the heart of a rocker. Slip it on. Crank it up.